For me, Margaree Valley is the heart of Cape Breton Island. 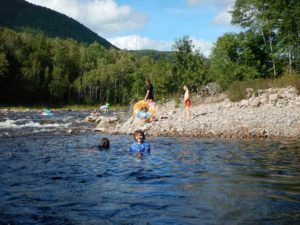 Our first introduction to the Valley, was the Margaree Beach. It seemed to take forever to reach it from Baddeck, but the scenery was awesome and the company great. As one of the last activities we could fit in with the Knechtle family before they had to leave, it was just perfect. The temperature of the sea water was icy cold, like Yzerfontein in South Africa. (The locals told us that it was unusually warm that day.) Not many of us chose to swim, but there were plenty of other things to do. 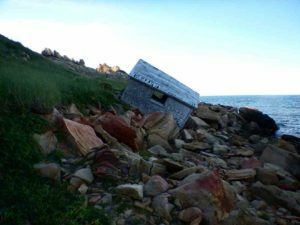 There is a very old building that is sliding down (and apparently have been for a long time) towards the sea. This apparition just begged to be explored. On the other side there is a cliff from which it is possible to dig clay. Marike and Franci spend a long time there and Marike made a few things. Unfortunately none survived the journey back to Baddeck. The real reason for the trip was a visit with the local MacNeill family. Since their move to the Magaree valley during the previous year, Matthew and Blake Knechtle missed seeing their friends during their Summer holidays. Little did we know that the MacNeils would future so big in our own experience of Cape Breton. Right there on the beach, we established that they too, are Christians and that their Church seemed to be very similar to ours back home. 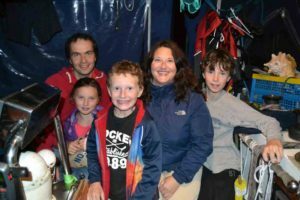 This family with their four children, are some of the most generous, hospitable people we know. With VERY short notice – after we found the little roadside café to be closed – they invited all 15 people in our party for dinner at their home. Their home is converted from an old local store and adjoining house. This was a store that Jennifer (the MacNeill mom), used to visit as a child. It was a warm, friendly, get together with lovely people and before we said our goodbyes, we were already making plans to visit Toni and Jennifer’s church on Sunday. 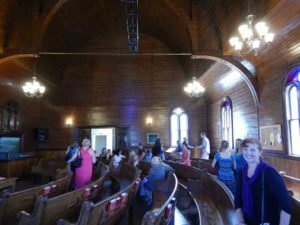 With the Knechtles leaving soon, we were planning to rent a car anyway, and would then be able to join the Margaree Valley Church for Worship. What a blessed time we had. Whenever we meet with true believers anywhere, we find family. Because we have the same Father, we are truly connected and immediately feel at home. The MacNeills invited us to lunch, together with a few of the families from church. Sitting at that dinner table, with healthy conversation flowing all around me, good food and people who obviously love each other – I suddenly wanted to burst into tears. It reminded me sooo much of a Midrand Chapel get together and what true friendships mean. After lunch, everybody just naturally migrated to the River. 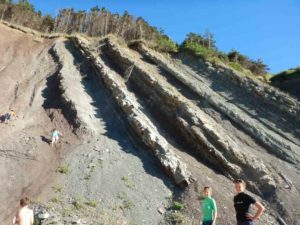 Summer in Cape Breton is so short, that they have to make the most of it when it is there. They cram all their activities into the 3 months of sunshine and then retire to a more sedentary lifestyle during the rest of the year, building up reserves again for the next Summer. Oh yes, the River. The whole Margaree turns up here on a Sunday afternoon. No entrance fee, no controlled access, no litter and the most beautiful scenery as the River meanders lazily down its path. Some people choose to jump down from the bridge, while others just enjoy the more relaxing activity of riding a tube down river for a while. This, more than anything else shouted out “Small Town Community living”. There were no formal rules, yet everybody watched out for everybody else’s kids. The amount of people were few enough that no crowd control was necessary at all. There was absolutely no fear of any belongings being unlawfully ‘taken’. In fact, the MacNeill’s deck chairs slept behind the trees for quite a while and everybody understood that they were their to use if needed. To tell the truth, this holds for the whole of Cape Breton, where people leave their car keys in the ignition when dashing into the grocery store! What an absolutely relaxing, lazy Sunday afternoon. However, our Sunday was not over yet. In church that morning, the Pastor shared how he always closely watches the use of the Maple syrup at the breakfast table. He doesn’t want it to disappear too quickly – as it is so precious. The lady to my left turned to me to say that they better give him some Maple syrup as a gift. It turned out that they have a forest of Maple trees on their farm and collect and sell the syrup. 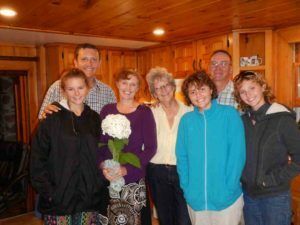 Immediately after the service, we made an appointment to go and see the Hart family after our visit with the MacNeils. Elmar and his daughter Dorothy took us for a thorough walk through the operations. We learnt all about collecting the Sap. First and second rising. Metres and metres of piping that need to be cleaned after every collection so that mould does not set in. How to measure the thickness of the syrup. Where they boil and bottle it. Really, all that you need to do to end up with that delicious treat on your table. A profoundly tricky business, we decided. Not to be attempted by the faint of heart. Later, Dorothy let us watch her and Elmar smoke out her beehive. This was done so that she could add some more living space for the bees to expand into. 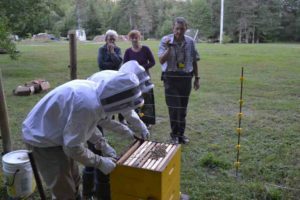 In Cape Breton, they keep their beehives inside electric fences. 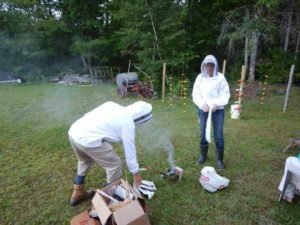 This is not for the bees, but to keep the bears from raiding the hives. Especially when they come out of hibernation ravenously hungry! By the way, to our great disappointment, we never saw any bears. We spend some time in the Hart’s lovely home, where Martha gave us some Maple butter to taste. It was so yummy that we just had to include some of that in our Maple syrup order. Thank you Harts! Such an appropriate name for such a lovely family. 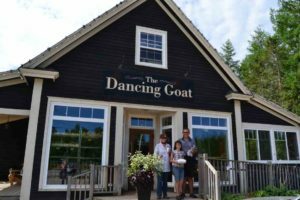 I cannot leave Margaree Valley without mentioning the ‘Dancing Goat’. Right at the turn-off to Margaree Valley, this Delicatessen stands on its own reputation. Jen Toni (to distinguish her from other Jennifers you add the husband’s name), told us that it prepares the best food in the world. I told her that since we will be seeing quite a bit of the world, we would have to taste their wares and will keep her posted as we travel. So far, Jennifer, the Dancing Goat is still ahead. It was a bit of touch and go in New York though. 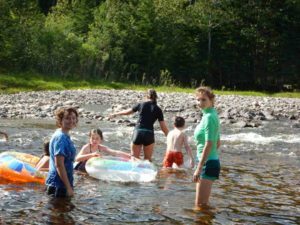 Not only does Margaree Valley seem to be the heart of Cape Breton, but the people and surroundings now take up permanent quarters in our hearts. And if I’m ever in danger of forgetting you all, (which I’m not), I just need to crush some garlic and the face of my beautiful friend, Jen Toni, fills my mind so that I start missing you all over again.